Serving the popular destinations of Galway and Limerick in southwest Ireland, Shannon Airport is one of the few European airports to offer U.S. Customs and Border Protection pre-clearance for passengers travelling to the USA. Our Shannon Airport guide includes contact details as well as information on facilities, transport and accommodation options. Both the airport information desk and the tourist information and reservations centre are located in the arrivals concourse. From Limerick, Shannon Airport can be reached on the northbound N18; or from Galway on the southbound N18/M18. From these routes, take the junction for Shannon Airport at Bunratty Castle and Folk Park and bear right on the N19/E20. Shannon Airport is situated 24km (15 miles) northwest of Limerick and 90km (56 miles) south of Galway. Bus:J. J. Kavanagh and Sons (tel: +353 818 333 222;www.jjkavanagh.ie) operates regular services from Shannon Airport to Limerick (journey time: 45 minutes, fare: from €5) and onwards to Dublin (journey time from Limerick to Dublin: 3 hours 30 minutes; fare: €20.00). Bus Éireann (tel: +353 61 313 333;www.buseireann.ie) offers coach connections to and from all major Irish cities. Taxi:Taxis drop off passengers on the departures courtyard outside the terminal building and pick up outside Arrivals. There is a taxi desk (tel: +353 61 471 538; www.shannonairportcab.com) in the arrivals hall for bookings. The journey time to central Limerick is about 35 minutes, and the fare is around €35. There are three bureaux de change in the terminal building: one each in the check-in area, arrivals hall and departure lounge. Full banking facilities, including ATMs, are also available. There is a self-service restaurant in the check-in area and a café/snack bar in the arrivals hall. Post-security, there is a café in the transit area and a pub in the departures lounge that is open 24 hours a day. There is a small selection of shops at Shannon Airport. These include a gift shop and a bookshop/newsagents in the public area. Additional gift shops and newsagents can be found post-security, where there is also a duty-free outlet selling a range of goods. A left-luggage service (tel: +353 87 328 5935) is available at the airport and is located in the arrivals hall. A Lost Property Office is also available at this location (tel: +353 87 328 5935) dealing with all lost and found enquiries for items within the terminals. A porter can be summoned for assistance via the telephones situated throughout the terminal. Other facilities at Shannon Airport include two nurseries (one each in the departures lounge and arrivals concourse), a children's play area and a small oratory. The Rineanna Suite is located next to gate 7 and is open to all for a fee (free to some members). Groups can request executive lounge facilities for corporate events, press launches and business meetings (tel: +353 61 712 497). Meeting rooms are also available at the on-site Park Inn Shannon Airport Hotel (tel: +353 61 471 122;www.parkinn.ie). Free Wi-Fi internet access is available throughout Shannon Airport. Fixed computers, offering broadband internet access, are also available in the on-site newsagents. Public telephones and an on-site postbox are also present within the terminal. Shannon Airport has a range of facilities to suit the needs of disabled passengers. Lifts, ramps, specially adapted payphones and disabled toilets are located throughout the terminal building. Wheelchairs are available free of charge on request for use within the airport. There are two clearly marked spaces for drivers to pick-up and set-down disabled travellers in front of the terminal, and reserved parking is available adjacent to the terminal entrances in the short-term car park. Passengers requiring special assistance should inform their airline prior to travel. There are more than 5,000 car parking spaces at Shannon Airport. 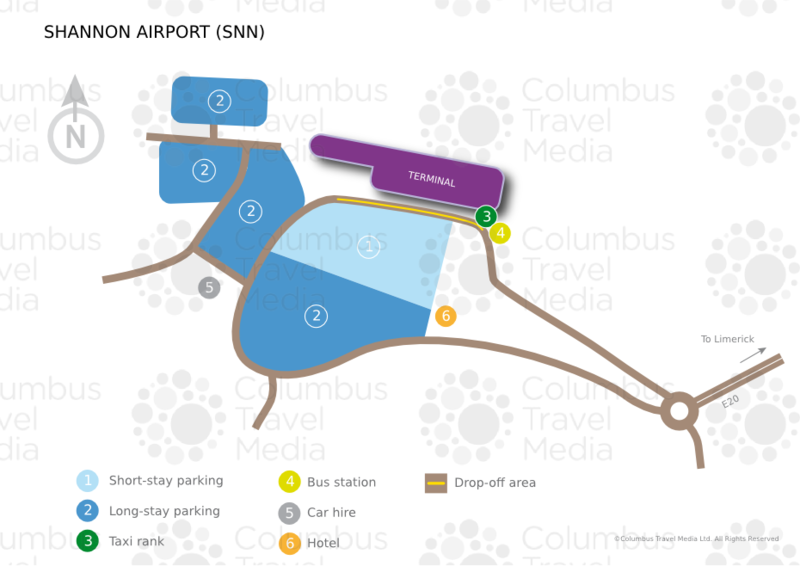 Short-term parking is available directly in front of the terminal building, and a number of long-term car parks can be found a short walk away. Car hire companies at Shannon Airport include: Avis, Budget, Europcar, Enterprise, Hertz and Thrifty. Each of these providers has a desk in the arrivals hall.